7SII, Vivitar 35ES, Yashicas, Ricoh 500, Mamiya 135, Oly 35 RC, Konica S, SII, & Auto S, etc etc the Yashica GX is pretty good. It’s not a guess but a fact... the Konica Auto S2 has the best viewfinder of any fixed lens rangefinder camera on the planet. I had a chance to test out most of these in shops. A cleaned QL17G III has a VF very similar to the X100s, just slightly smaller and with a blue tint (for RF contrast I guess) which I think is quite impressive. Good camera, though with a short focus throw and base length it's not especially easy to hit focus wide open and at shorter distances. The Konica IIIA and IIIM have the best viewfinders, hands down, nothing else is even close. They are large and bright, with a 1 to 1 view, and the frame lines adjust for both parallax and image size. The Konica IIIA and IIIM finders even beat out my better rangefinder cameras, like the Canon 7, Nikon SP, and various Leica M cameras. Like the more expensive rangefinder cameras, the Konica viewfinders are an assortment of solid glass prisms, not the cheap mirrors and lenses used on most fixed lens cameras. You really have to try one of these Konicas and see for yourself. "Other" scored fairly well but there's no distinction made among the "Other", the "Other II", the post-WWII "Other II", the "Other IIs" and the rare and coveted "Other SE ." I believe the "Other IIs" was created to solve the "Other II" RF flare problems. The "SE" was available in lizard and orangutang. I've owned most of the camera in this poll at one time or another, but my favorite camera among them is the Voiglander Vitomatic II with its 2.8/50 color skopar lens, particularly because of its big, bright viewfinder! The C35FD/ Auto S3 shares the same chassis and shutter with Minolta 7sII, Vivitar 35ES and Revue 400SE, but is the only camera in the crowd featuring a 38/1.8 lens. All others have 40/1.7, which is outstanding in its own right. I always believe there is nothing wrong should all were built by Cosina (and the reason some vigorously denying the speculation) - definitely a capable manufacturer, look at what they are doing today. I own a Konica Auto S3, Minolta 7sII, Vivitar 35ES and Revue 400SE. They all do in fact share the same Copal leaf shutter, however the Konica chassis is physically smaller than the chassis' of the other three cameras. To your contention: are we to believe that Cosina made a smaller chassis for Konica in 1973, and when the other three were introduced 4/5 years later in 1977/78 that Cosina marginally scaled up the chassis? I'm having a difficult time understanding your point that the cameras share the same chassis when the Konica's chassis is physically smaller. There is another camera fitted with an identical sized chassis to the Konica Auto S3 and it's called the Konica C35. The top cap on the Auto S3 is higher than the C35 as it has a larger rangefinder and the mechanical synchro-flash mechanism. The rangefinder in the Konica Auto S3 is vastly superior to the other three cameras and the lens in the Auto S3 is without parallel. The synchro-flash mechanism in the Auto S3 was also unique and superior as was the ability of the Konica to meter in manual mode. The Vivitar and the Revue clearly came from the same origin and it makes good sense that Cosina built these two cameras as they had so many other models for these two marketing companies. The Minolta is similar enough to the Vivitar and Revue that it makes sense that Minolta purchased the basic chassis. This speculation is supported by the fact that the 7sII shares nothing with the previous generation Hi-Matic E/F/G variants (all of which were better built than the 7sII). Other than repeating the same old saw, what empirical evidence supports your contention? I have been researching these rangefinders quite a bit now, and I have narrowed it down to the Konica S3 and the Olympus 35 RD... anyone have an opinion on which one is "better"? I know both are rare and both have good glass. From the pictures I've seen, not experience, the S3 seems to have better glass, but it is shutter priority only. I am currently living in China and have access to both, both in good condition - so strictly regarding features and awesomeness...suggestions? have access to both, both in good condition - so strictly regarding features and awesomeness...suggestions? Can't step into your shoes, anyway....getting both, deciding and selling one you like less is the option? Glass, scmass - it's all secondary when it comes to bonding with camera. People just look they are same, but in fact they aren't just like all cameras look similar. One prefers ergonomics (and many have completely different measures for this), other will choose certain features....so no one and only choice there, leave alone the only right choice. I have been researching these rangefinders quite a bit now, and I have narrowed it down to the Konica S3 and the Olympus 35 RD... anyone have an opinion on which one is "better"? I know both are rare and both have good glass. I have owned and used both cameras. The RD is well known to generate a sticky aperture every ten years or so. Otherwise it's a sturdy and problem free tool. It feels slightly front heavy because of its relatively large size optics. In my opinion it has a slightly better lens than KAS3. The KAS3 can sometimes feel a bit cheapish. The lens section feels wobbly and the large front viewfinder window is attached with only a few tiny drops of glue. My choice would be to take the one in better overall condition but generally I like the RD more. For my cameras, l like the viewfinder on my Canon New Canonet QL17 a lot. It's big and bright and clear, even with glasses. Next, I like my Bell & Howell Dial 35-2 hall-frame (made by Canon too), also because its viewfinder is big and bright, even with glasses. My Leica M3 is a close third, losing out only because its viewfinder seems to have been designed for use without glasses. At the other end of the things, my Olympus XA's viewfinder and my new Minox 35 EL both have small viewfinders that aren't designed for glasses, especially the XA. Yeah, the XA's viewfinder/rangefinder works OK, but it's not my favorite, and the 35 EL's viewfinder leaves the exposure meter unlit and half out of frame except when viewing a really well lit scene, at least with my glasses on. I can also see why Japanese SLR's came to rule the market, with their excellent viewfinders. None of my rangefinders or zone focus cameras are as good as my Konica or Canon SLR viewfinders. very well. Excellent handling and wonderful lens. f. Does not require precisely centering your eye to be able to see the picture correctly. Kodak Retina IIIc: The often maligned Retina viewfinder is actually very good for low light, and complies with (a, c, d). Lacks on the other criteria. Karat IV: All except (d and e), because it has no framelines. Yashica 35GL: Complies all except (a,b): Distorts the picture and the eyepoint is too close. Note: I don't wear or need glasses and my eyesight is 20/20. Vitoret DR: Complies with all requirements except (e); it is an 1.0x magnification viewfinder that is very very comfortable. A nice surprise! Waltz Envoy: The semi-transparent mirror was worn down so I replaced it with a spare from a Yashica 14N. Now i have an excellent, clear, contrasty viewfinder that complies with all requirements except (d) because i've found that the framelines are too narrow compared to the actual FOV of the lens. Voigtlander VF101: Not bad but doensn't really comply with the above requirements except for (c) and (f). PS: I also own a Oly 35SP and, while mine needs cleaning for proper assessment, i don't find it the ultimate viewfinder, not by any stretch. The eyepoint is a bit uncomfortable, parallax correction is not automatic, and it appears there is little contrast between the image and the rangefinder patch. Still, i need to clean it before proper assessment. The Oly 35SP is of the best fixed lens rangefinders ever. Small quite capable with a sweet spot metering function and excellent lens. Mine has a contrasty rangefinder patch although it is bit small, but next best on this would be a Leica rangefinder camera. My next best is the Kodak Retina II. One of the most compact rangefinder cameras with great lenses but a rather squinty rangefinder/viewfinder. Out of those, I prefer the finder of the SP. its viewfinder is clear-er than the others in my opinion. It is also the largest of the group. The retina IIA is usable. I also have a Konica IIIA and a Retina IIIC. I should bring them out and compare. There are also many larger rangefinders that may have better finders.. Konica Auto S/S2, Minolta Hi-Matic, Yashica 35GS, Canon QL17 (original), Olympus auto-eye. The SP viewfinder (at least a clean one) seems to have more contrast, along with the Rollei XF35 with the round RF patch - perhaps coated vf optics? 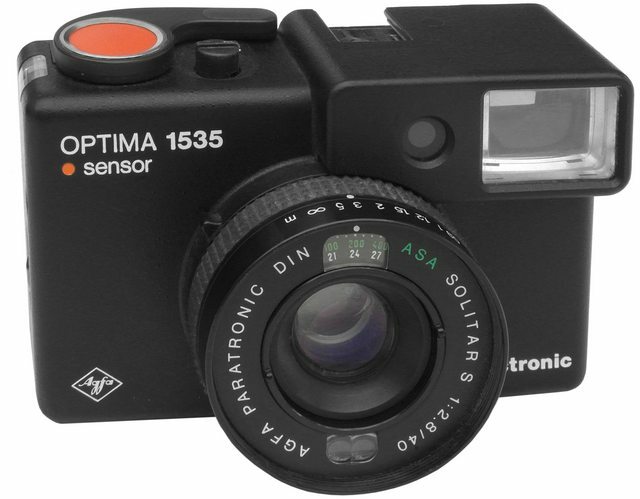 In my collection so far, I think it has to be the Agfa Optima 1535. The focus mechanism isn't that great though, and there are other quirks. Incredible viewfinder though. Easily the best out of this lot. For 35mm I have or had Olympus 35RC, Minolta 7S, Olympus XA,Konica S3, Konica S1.6, Yashica GSN, Yashica CC, Retinas II/IIA,IIIc,IIIC, Contax T, Konica I and IIIA, Voigtlander Vitessa and VitoIII and probably a few others I am forgetting. The 35RC finder is nice with the aperture and shutter speed display in it. The S1.6 has a very nice parallax/size corrected finder. The CCs slightly colored finder has great contrast as does the Contax T but the most impressive finder is the Konica IIIA. Hard to beat that 1:1 parallax/size corrected finder. I just put a piece of developed but blank film over the front of the viewfinder window (it fits in behind the housing) and the difference in contrast with the rangefinder image is amazing with very little brightness loss. Huss, thanks for the reminder about the Optima series. They faded in the mist of my memory, possibly because very few made it to this border outpost we call 'The United States'. Location: "Somewhere over the rainbow"
I think the Voigtlander VITO III is one of the best fixed lens rangefinders.The finder and rangefinder spot make it very easy to get sharp focus. Digital - Olympus Pen E-P5 ~ VF4 ~ 50 /1.8 Cine - Nikkor. Not only because I have three and love them, but the Minolta Hi Matic 9 wasn't on the list. Nor was the Petri 7s, which is a great lesser known FLR that does full manual, as does the Hi MAtic 9. Most of the others are all aperture or shutter priority arent they? "I was once Helsinki's greatest acrobatic Dwarf"